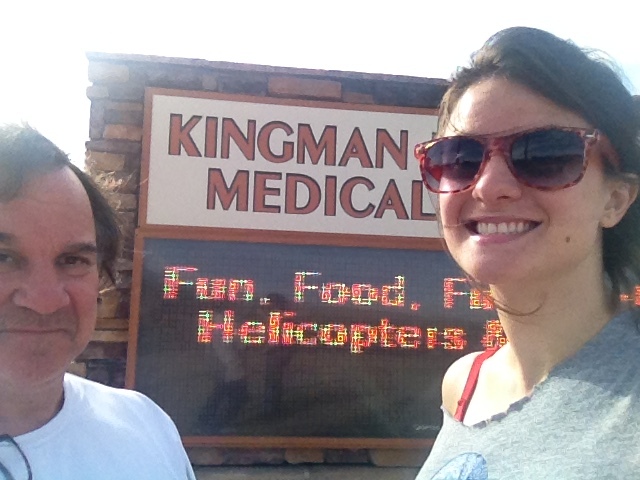 Kingman | Paul's Voyage of Discovery & Etc. 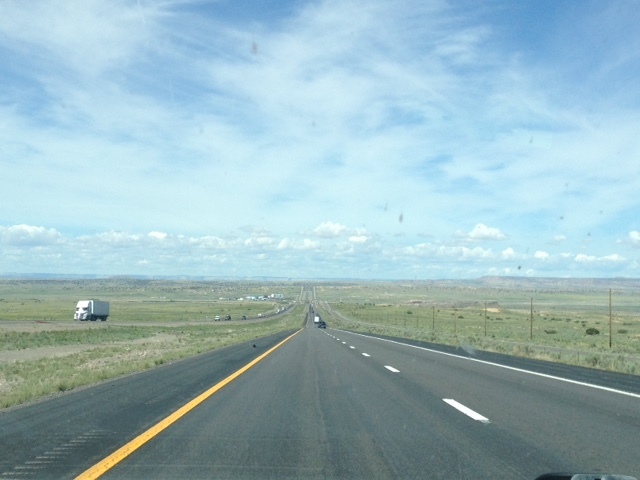 Travel my way — take the highway that’s the best. 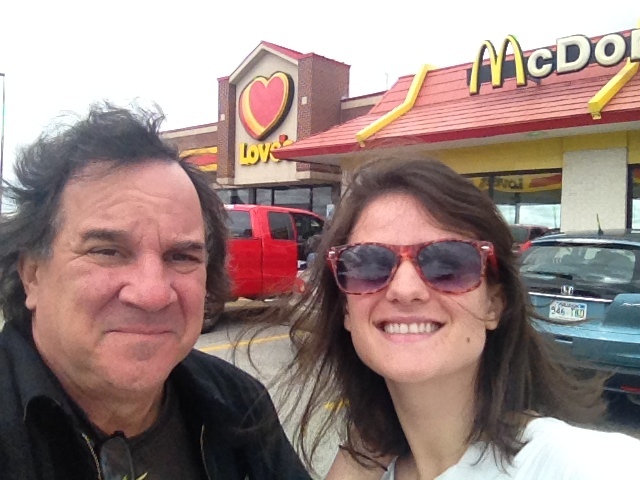 When my daughter Emilia and I made our plan to motor west from Chicago to Los Angeles over the course of two marathon days in May, it was her desire that we get our California-bound kicks on that legendary highway — Route 66. 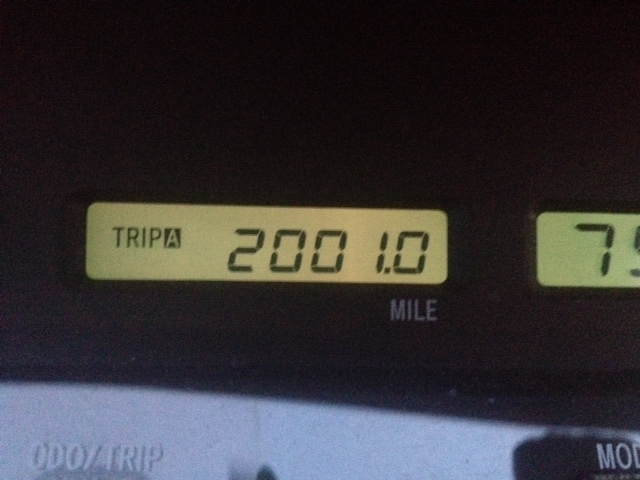 More than 2,000 miles all the way. 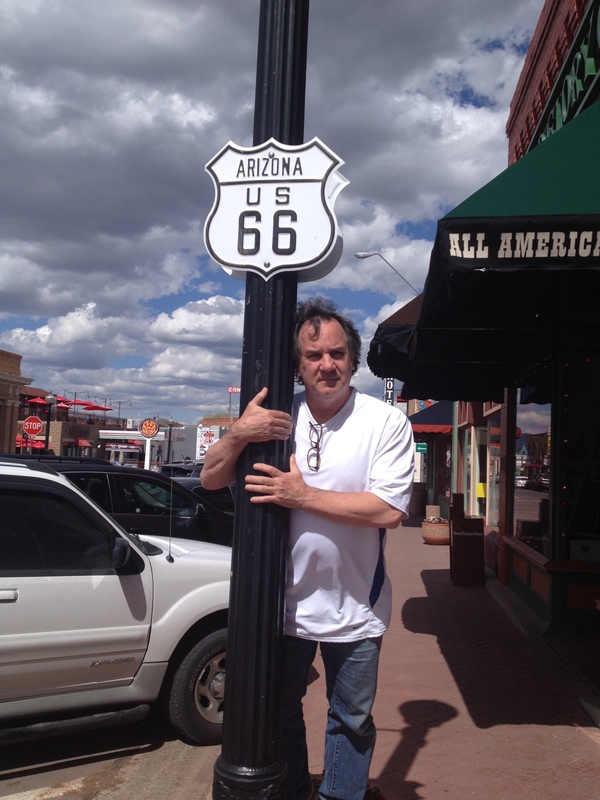 I’d first driven the 2,150 miles from Chicago to LA – south on I-55 and west on I-40 along the path of the old U.S. Route 66 – back in 1991 when I planted my flag in Southern California to stake a claim in the television biz. 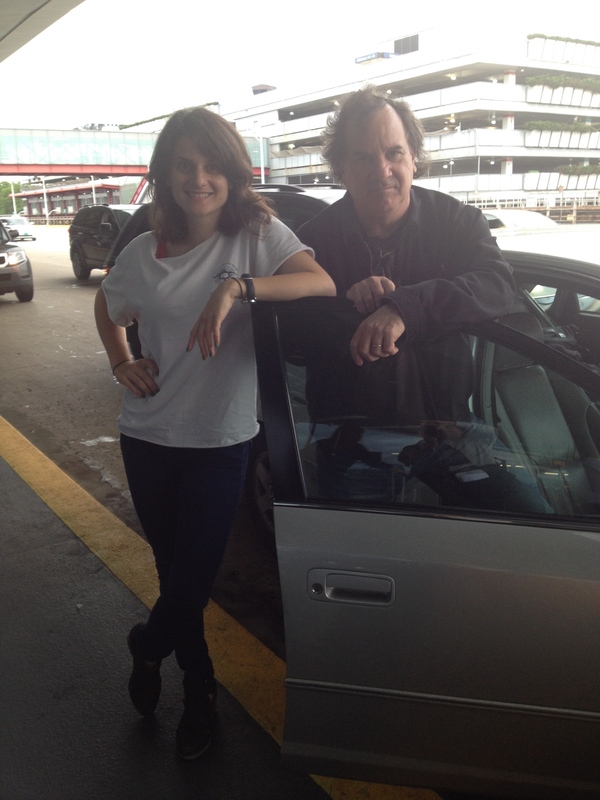 Now, nearly a quarter of a century later, I was winding my way from Chicago to the west coast with the girl whose birth in ‘91 was one of the primary catalysts for our relocation to more lucrative employment in Hollywood. 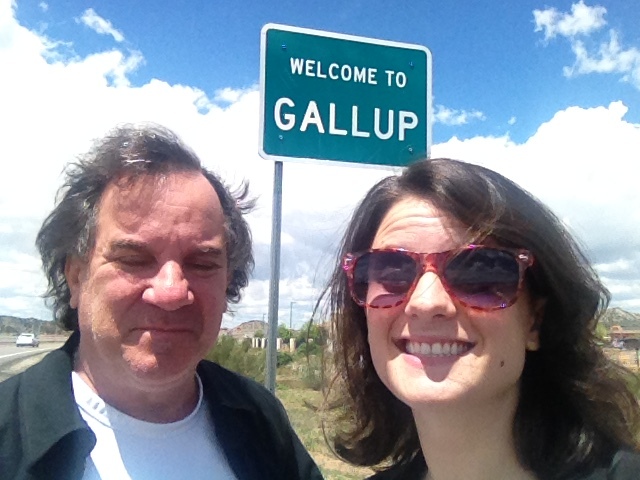 Emilia was gung-ho for the trip, eager to check off each of the ten cities listed in songwriter Bobby Troup’s much-covered classic. Troup wrote the song in 1946 on his own journey toward a career in the western Mecca of the entertainment business — immortalizing an itinerary of stops along The Mother Road, spanning the western two-thirds of America from the Windy City to the City of Angels. Oklahoma City is mighty pretty. Nearly 70 years ago, when Bobby Troup made his pilgrim’s progress westward, the Main Street of America was just a series of two-lane blacktops: various State Routes snaking their way through the heart of each of the municipalities mentioned in Troup’s celebrated, syncopated lyrics. As postwar traffic along Route 66 increased and peaked over the following decades, the towns it traversed adapted and grew to meet the demands of highway travelers. In the years after President Eisenhower launched construction of the Interstate Highway System in 1956, the wide concrete belts of I-55 and I-40 mostly skirted the various city centers, bypassing many of the roads that had made up old Route 66. And while the driving time from Chicago to LA was reduced dramatically – so, too, was the colorful, unique local character of the Route 66 experience. You can still find original sections of the Mother Road – many of them just off an exit, running parallel to Ike’s great Interstates — the old motels, restaurants, gas stations, and roadside attractions in varying degrees of dilapidation, dowdiness and decay. Yet, some towns have managed to maintain carefully preserved stretches of old Route 66, doing a brisk trade in food, fuel, lodging, and nostalgia. Won’t you get hip to this timely tip? 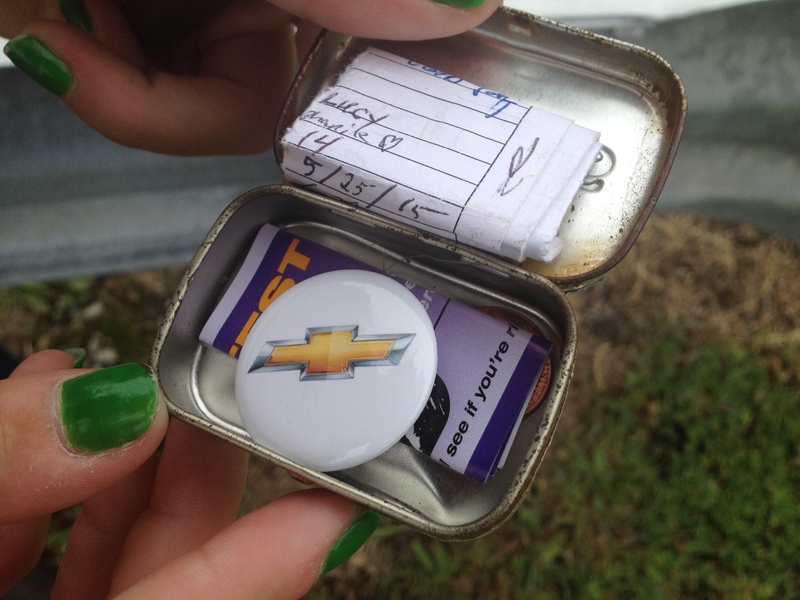 As we set out from Chicago, Emilia put just one other item on our two-day road agenda: geocaching. 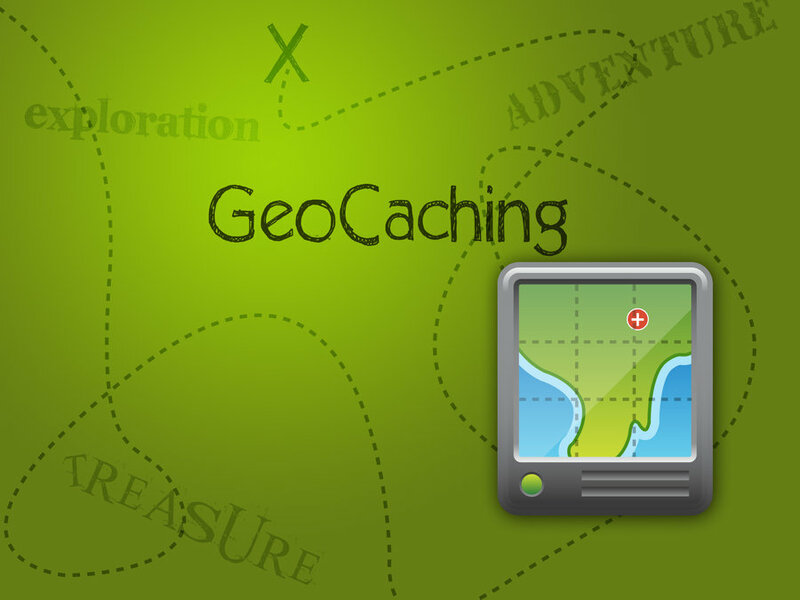 You may not know this, but millions of people around the world have hidden even more millions of small treasures called “geocaches” in interesting locations across the globe — challenging fellow geocache enthusiasts to find them, armed only with a set of GPS coordinates. Emilia was determined to find at least one geocache in every state along the way in which she hadn’t already logged a find. 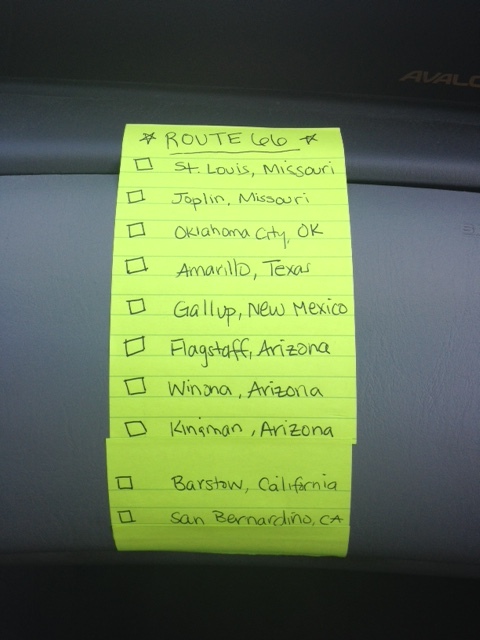 So I knew we’d be poking around odd corners just off the highway in Oklahoma, Texas, New Mexico and Arizona. The drive south along I-55 through the prairie and farmlands of Illinois toward St. Louis is long, flat and straight. There are few curves in the road and even fewer hills. We made good time through the Land of Lincoln, our progress interrupted only once – when a sudden cloudburst drenched the highway in sheets of rain through which we couldn’t see more than 10 feet ahead. 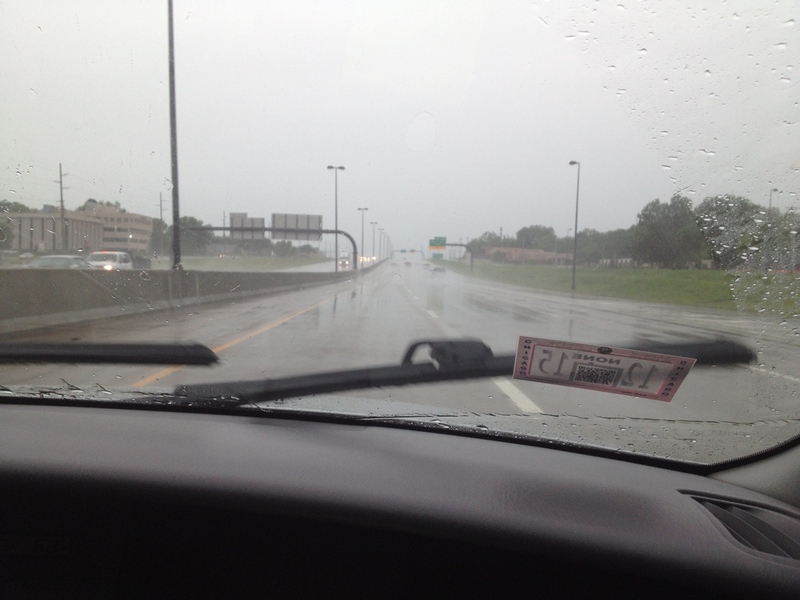 Luckily, the downpour ended as quickly as it began, and we rolled into St. Louis, Missouri under blue skies. 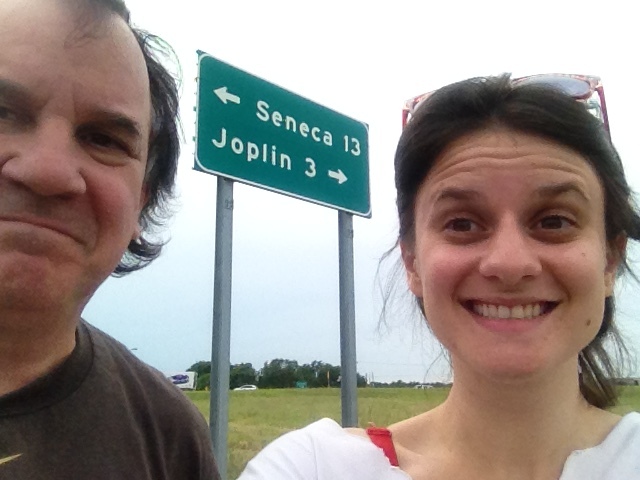 Sighting The Gateway Arch which dominates the St. Louis skyline, we exited I-55 to take the first of our selfies to commemorate our arrival in each town name-dropped by Bobby Troup. There’s not much to say about our Joplin experience as it’s one of those towns that have been bypassed by Ike’s Interstate. Thus, what we saw of Joplin was similar to what we passed driving through lots of communities along the modern Mother Road: franchise restaurants, sequences of tacky roadside signs extolling the virtues of various upcoming gift-cheese-fireworks-souvenir-gun-knife-Indian trinket shops, and truck stops like Mother’s – where we paused to look for a CD of “Cracked Rear View” by Hootie & The Blowfish – and actually found it! 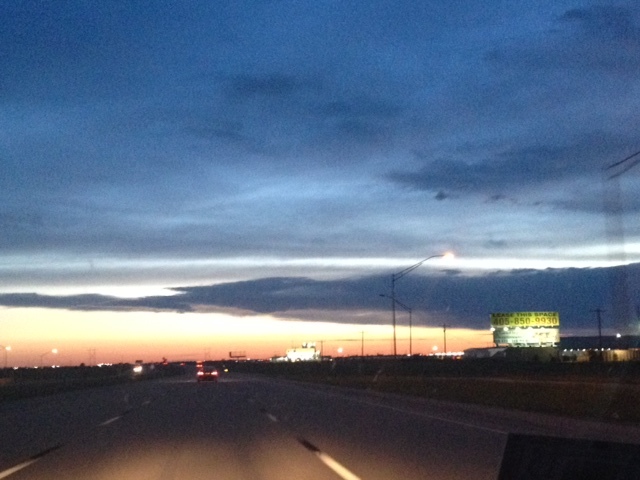 If Oklahoma City is pretty at all, we couldn’t tell. 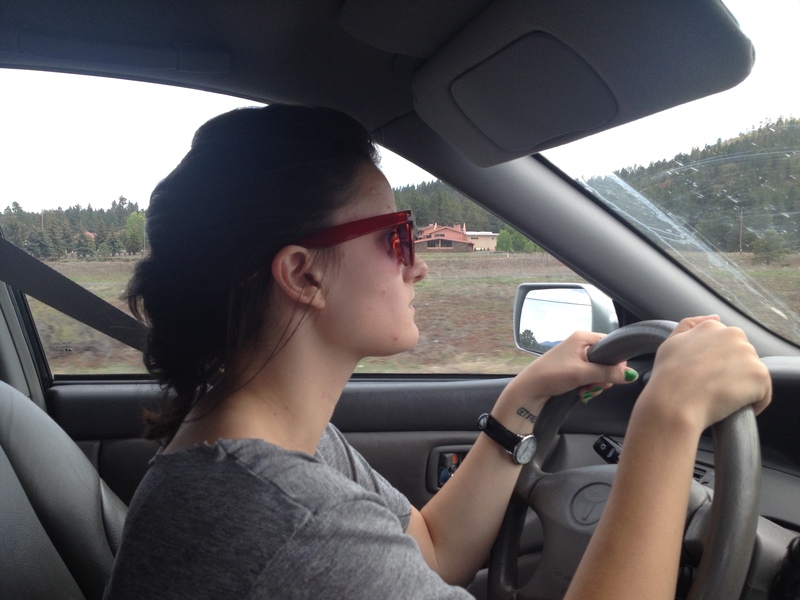 Emilia was at the wheel and the weather turned foul as we made our way through OKC. Rain fell from the cloud-darkened sky, illuminated by sudden flashes of lightning and the sound of distant thunder that doubtless gave the city’s NBA team its name. 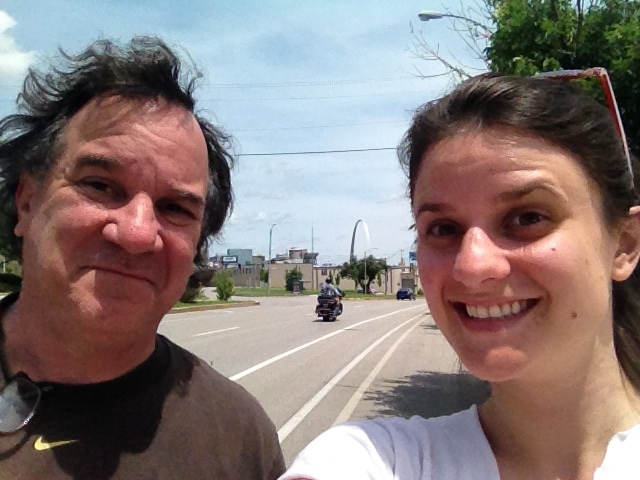 Emilia did a great job negotiating the heaviest stretch of traffic we saw on the trip – and the weather broke just long enough for us to collect our selfie. 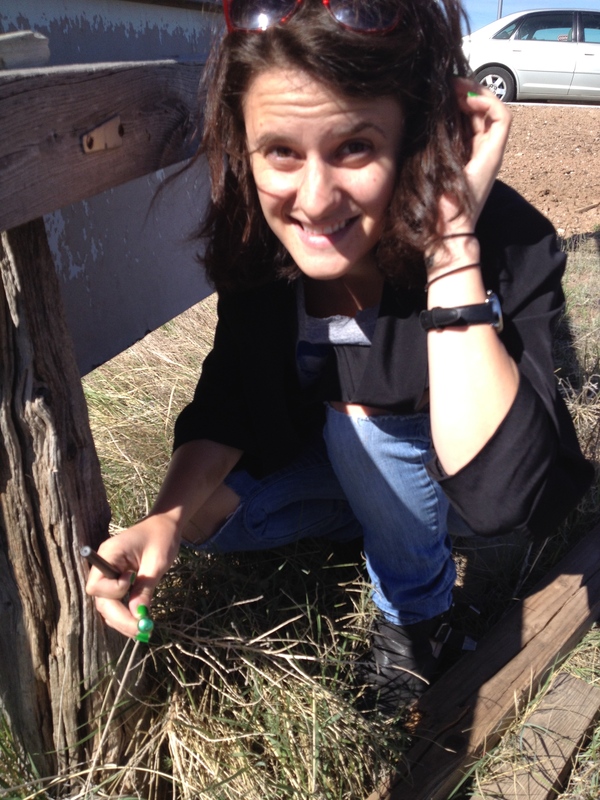 And now that we were in Oklahoma, it was time to find our first geocache – which Emilia located near the parking lot of one of those ubiquitous truck stops. We grabbed a fast food dinner, I went back behind the wheel, and we listened to the Houston Rockets regain some measure of respect in Game 4 of the Western Conference Finals against the Golden State Warriors. It was near midnight when we pulled into the parking lot of the Holiday Inn Express in Amarillo, Texas – after driving more than 1,000 miles during our first day. We grabbed five hours worth of sleep in a couple of very comfy beds – then got back on the road by 6:00 AM the next morning. 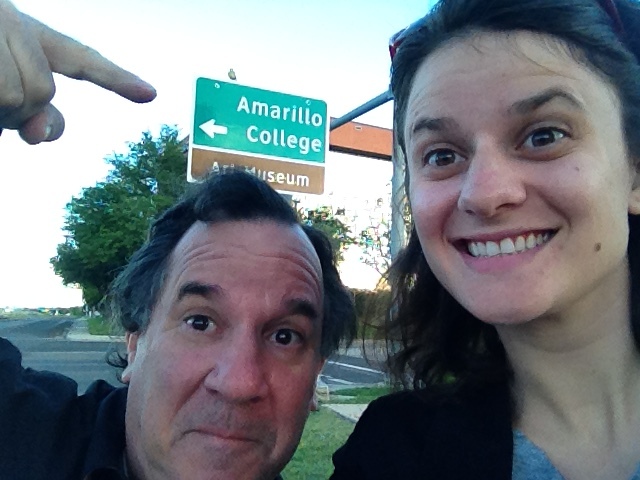 We took our Amarillo selfie – and before long, Emilia found her Texas geocache. Those were the two highlights of our rather dull, flat, straight drive across the windswept Texas panhandle, marked by herds of cud-chewing cows and farmlands that extended far into the horizon without a hint of a hill to be had. Luckily, the speed limit for most of I-40 in Texas is 75 MPH – and I took every advantage of the opportunity to race through Ted Cruz’ state just as fast as we (legally) could. 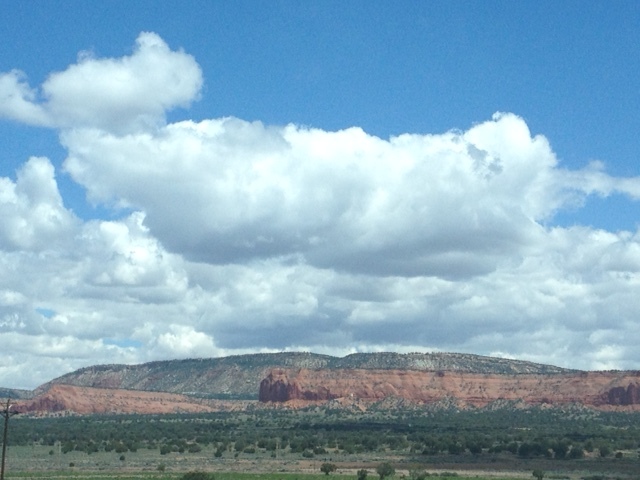 As we crossed from Texas into New Mexico, the landscape soon developed new contours: hills, then bluffs, then dramatic red rock mesas. The chaparral was still quite green and the combination of brilliant blue sky, white clouds, red rock and mountain greenery were a joy to behold. 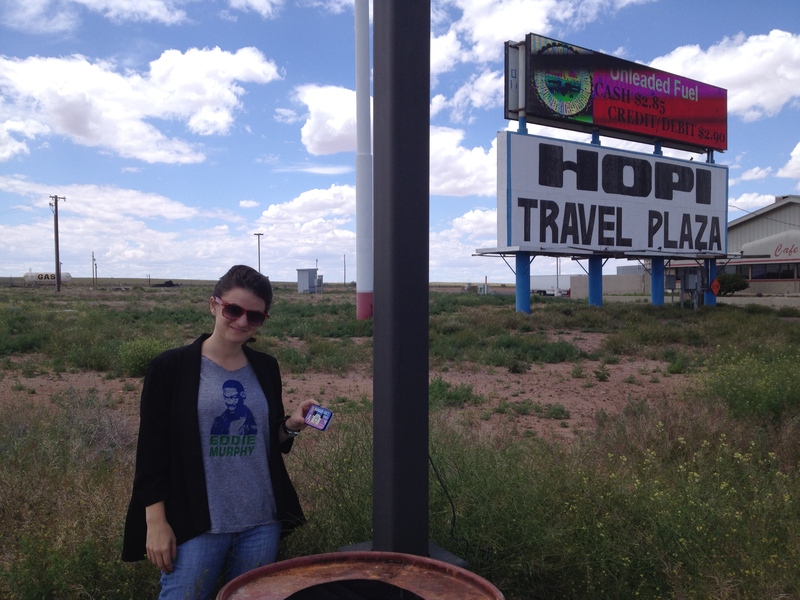 We scored our New Mexico cache at another truck stop. This time, I was the one who discovered the tiny two-inch long aluminum tube, dangling from a thin chain into a hole in the ground next to a weathered wooden post holding up what was left of a battered old sign. Our family has been to Flagstaff before (and to nearby, magical Sedona) on a family vacation to the Grand Canyon. Emilia was about 7 years old at the time, but the week we spent exploring this part of Arizona made a deep impression. And speaking of deep impressions, Emilia and I could drive past the famous Meteor Crater just east of Flagstaff because we’d already seen that prehistoric wonder. We turned off the road to get a snack, refuel and find Emilia’s fourth hidden geocache. I was glad that the geocaching phase of our expedition was a success — and that my daughter could now log onto the Geocaching website and earn a badge for each of the four new states in which she found a cache — but I must admit that I was in a hurry to get to Williams, Arizona, just 35 miles west of Flagstaff on I-40. Bobby Troup didn’t put Williams, Arizona in his song, but it’s a “don’t miss” destination for those seeking retro Route 66 ambience. Since we left Chicago, as we passed various Route 66 highway signs along the road, I’d been telling Emilia that we’d have an ample opportunity to score the mother load of Mother Road signs when we got to Williams, AZ. And we were not disappointed. The last town bypassed by 1-40, Williams has preserved more than vintage signs. It boasts a town center featuring a half-dozen blocks of restored Route 66-era buildings facing an original stretch of the pre-Interstate road. 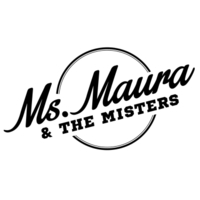 The local shopkeepers – mostly mom and pop’s — trade on the look and flavor of the 1930’s, 40’s and 50’s. Here, you can get a sense of how it might have been to journey westward through the heart of such towns rather than whizzing passing them at 75 miles an hour. 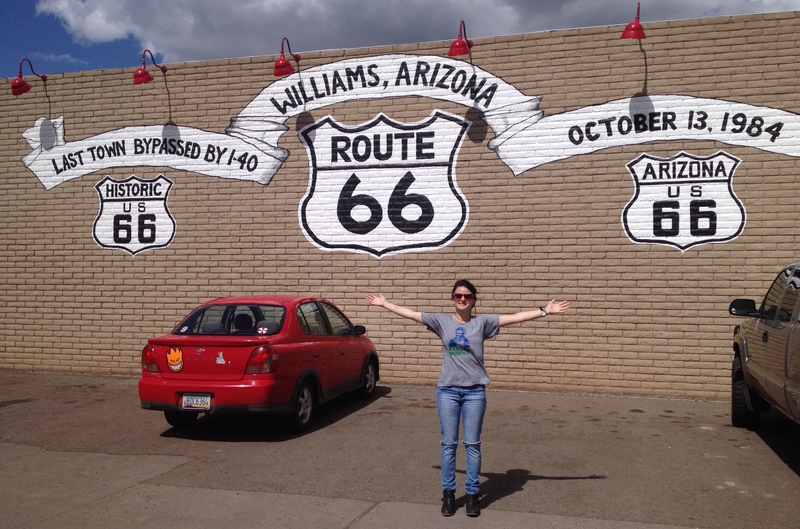 Williams has a special relationship to Route 66 and I-40. 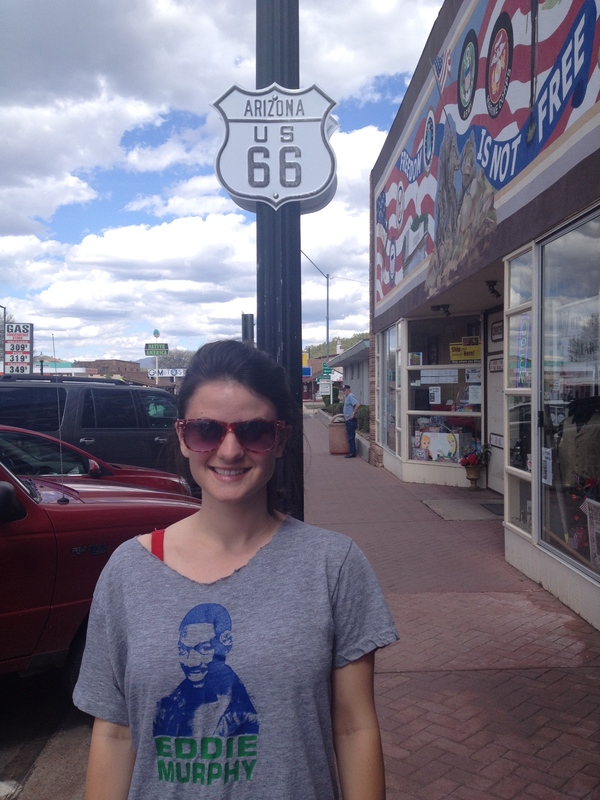 In fact, it was the last town to have its section of Route 66 bypassed. But the people of Williams didn’t give in to President Eisenhower’s great highway project without a fight. Their lawsuits held up the last section of I-40 for nearly three decades until a settlement gave Williams three highway exits: an outsized number given the town’s modest size. Williams was finally bypassed on October 13, 1984 – 15 years after Ike passed away. 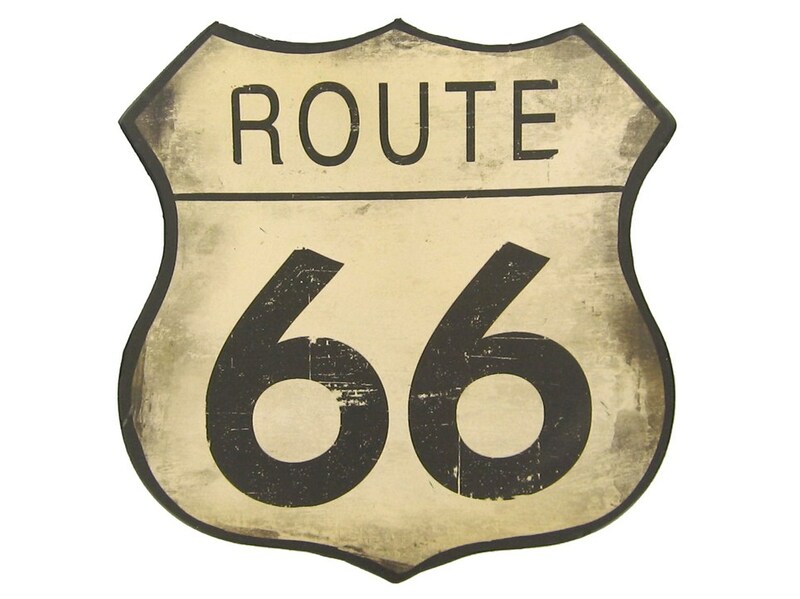 The next year, Route 66 was officially decommissioned. From then on, the Mother Road existed only in memory, legend and song. Oh, yeah. Here’s another timely tip. 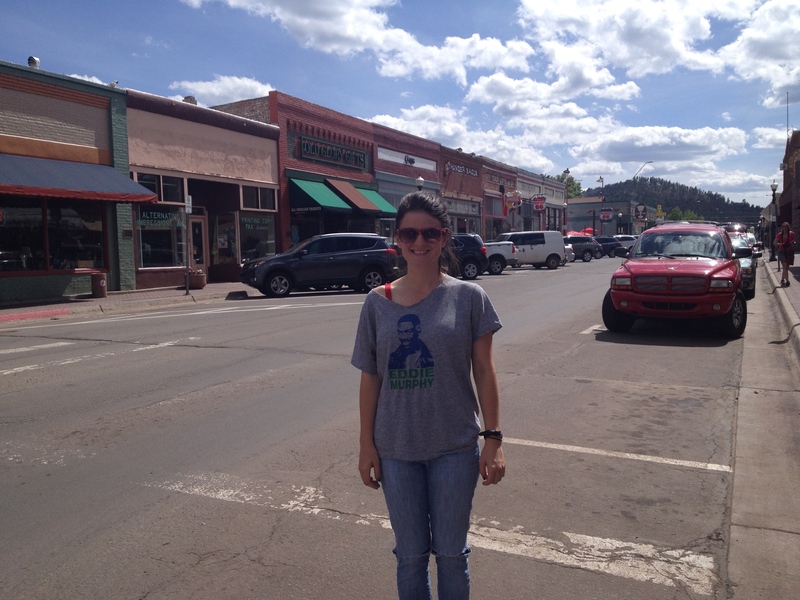 Winona, Arizona actually comes before Flagstaff when you’re driving west. A songwriter like Bobby Troup can be granted poetic license, but he disqualifies himself as a navigator. 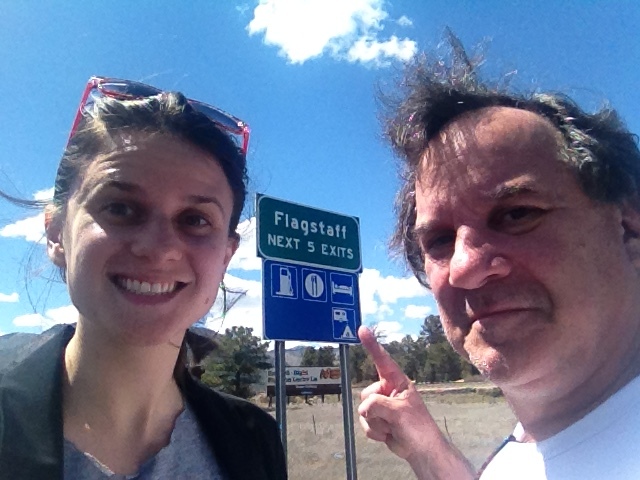 When Emilia and I took our required selfie we were still 15 miles east of Flagstaff. There was still plenty of sunlight left as we descended more than 3,200 feet in elevation over the 115 miles of 1-40 from Williams to Kingman, Arizona. 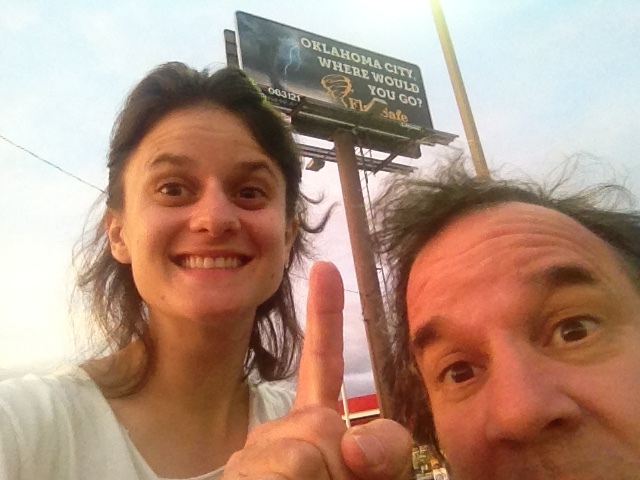 We were driving hard for California at this point – and Game Four of the NBA Eastern Conference Finals would be on the radio soon – so, we only spent enough time in Kingman to gas up, get a bite, and try to dial up the Cavaliers versus the Hawks. I’m a Clevelander born and raised. Listening to LeBron James and the Cavs close out the Atlanta Hawks would be an ideal end to this adventure. At first, as we burned up the high desert miles toward San Berdoo, our radio delivered a strong AM signal – and the Cavs were beating the Hawks handily. 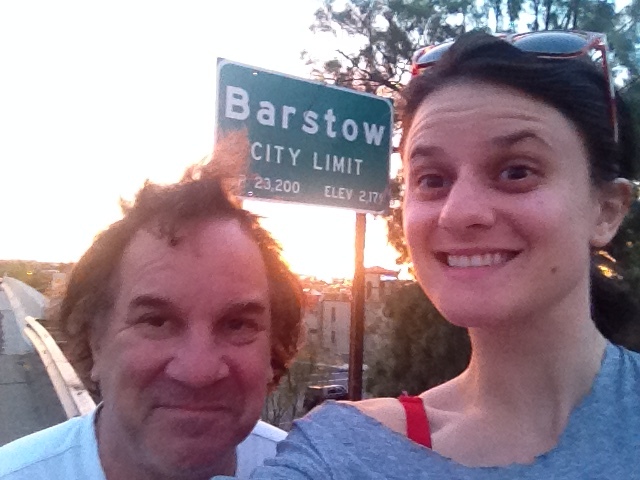 But there’s not much in the way of civilization between Kingman and San Bernardino (though we did stop in Barstow, CA for our requisite selfie) and as the sun went down, so did our radio station signal. At times we abandoned the faint, faltering, static-strangled broadcast and Emilia read the play-by-play on her NBA Gametime app. 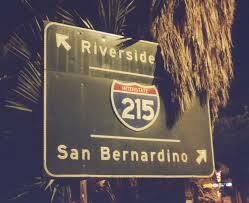 It was around 10:00 PM when we drove past San Bernardino in the heaviest traffic we’d seen since Oklahoma. It wasn’t easy to find a safe location for our selfie, so Emilia and I agreed to settle for a shot taken through the car window as we continued homeward. The local Los Angeles area sports talk radio channels were starting to come in loud and clear – and while my legs were cramping after long hours of driving, listening to excited post-game discussion of the Cavs’ victory gave me all the fuel I needed to power through the last stretches of the 10 and the 101 freeways. 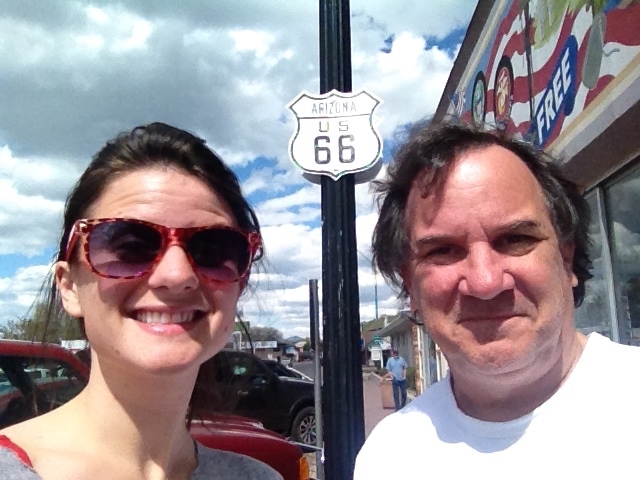 My daughter and I had traveled Route 66, covering more than 2,000 miles in less than two days. 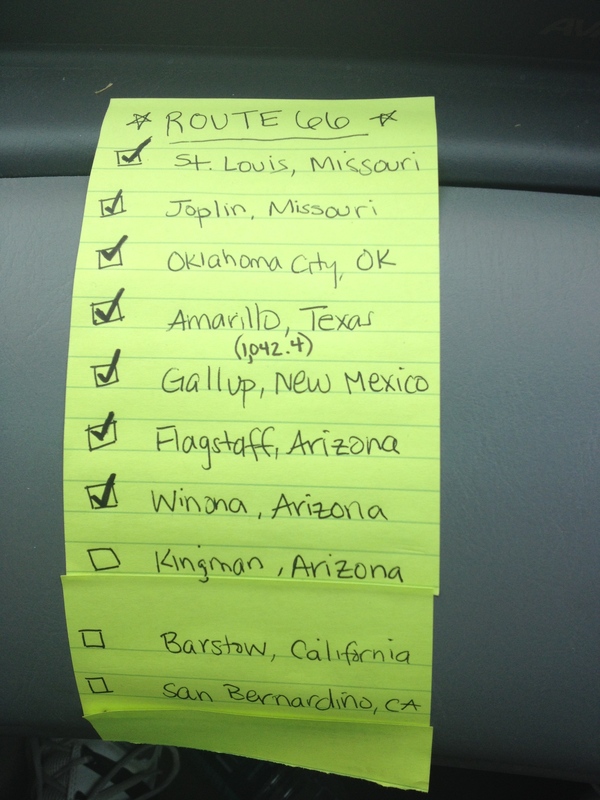 We touched base in every city in the song – and found a geocache in every state we needed to find one. We listened to two great basketball games on the radio and played “Cracked Rear View” and John Fogerty’s “Revival” several times. We got to know the country a little better along the way – and we also got to know each other better. It was, as Bobby Troup would say, a kick.